A Clinical Chart That is Also A Work of Art. 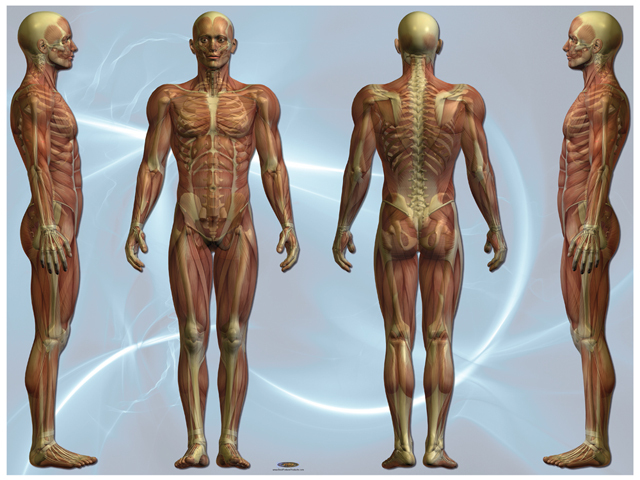 Designed by noted anatomy artist Dr. Joe Ventura, this 48 inches wide and 36 inches tall piece features four anatomically correct human muscles forms made slightly transparent to let the skeleton show through. The forms show all the surface muscles and the entire skeleton. Ideal as a quick reference and education chart WITHOUT that clinical look. Each print is on fine art lightweight vinyl that has an ultra rich look and feel, but is lightweight and can be mounted anywhere using poster putty. The forms are also in postural neutral and can be used in posture education. Click the button below to add the Muscles as Art Poster to your wish list.